Unitronics announced the launch of a new website at http://unitronicsplc.com/. The new website was built from the ground-up with the latest technology and runs on any mobile device. Fully optimized and based on the best current practices of web design, customers are able to find what they need quickly and easily. The site is chock-full of new materials, videos, success stories, and a highly-organized Technical Support section. 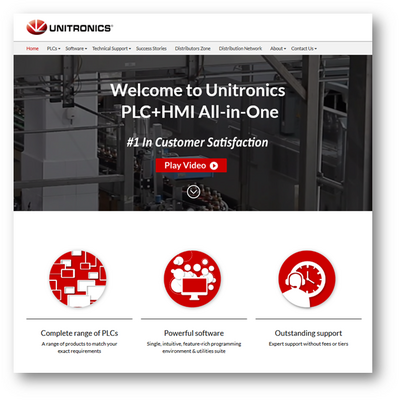 If you are an automation or control expert who is researching devices and platforms, the Unitronics site not only provides clear explanations of its complete range of PLCs— you can also download their All-in-One software packages, which are available at no extra charge, and try them out. An excellent video overview showing Unitronics’ core values, complete product lines, and added value is located at (https://www.youtube.com/watch?v=y8fIvyYqxS4).